How does freedom show up in your life? Are you appreciating or cultivating freedom in your life? We know there are millions of people around the world who don’t have what we typically think of as freedom. Everyday can be a blessing for those of us who do. Free to walk. Free to talk. Free to listen. We’re living in turbulent times and sometimes wonder what we can do to help and get through each day. We’ve all experienced difficult times in our personal or professional lives, often through events and circumstances outside our control. Like great trees, humans grow stronger when exposed to powerful winds. Here are 10 suggestions for dealing with challenges. Take responsibility. Assume an “I can do something” attitude rather than pointing fingers. If nothing else, you can control your own response to the situation. This also contributes to a sense of purpose. Limit the focus. Don’t let the problem become all encompassing. When you compartmentalize the difficulty, you can focus on a workable solution. Be optimistic. The ultimate belief in life as positive, even with sticky situations, will result in positive behaviors and positive actions and way more thriving! Think creatively. Approach the issue from new and different directions. Trust your creativity. Feeling stuck… reach out for support on this one! Have courage. Having courage doesn’t mean you’re not afraid. It means that you don’t let the fear get in the way of doing what you need to do. Sounds like freedom to me!! Take action. Handling the day-to-day details can keep you from getting bogged down in the mud of adversity. Determine what can be done, make a plan and hustle! Take the long-range view. “This too shall pass.” Recount other times when you have overcome challenges. You got this!! Maintain a sense of humor. One of my favorite questions is “What about this is amusing?” I understand that not everything is funny. Far from it. And, sometimes (often) amusement can help us move through situations. Get support. No need to do it alone. Ask for help. Don’t quit. Persistence may be the greatest of human qualities that help us overcome adversity and move forward. 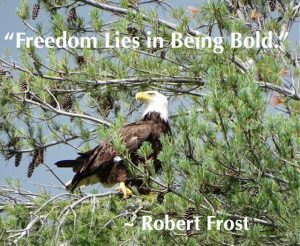 Freedom is not giving up, its moving forward with and through the obstacles that come our way. Now is a great time to connect with others in your community. Reach out and find out what you share in common. We’re really more alike than different. Most of us want similar things…to be healthy, to be happy, to find meaningful work, to share time with family and friends, to find joy and so much more! Previous PostPlaying it Safe in Cannabis Dispensaries – 5 tips! Next PostIndustry Questions & Answers with Maureen!